The cut-outs can be free-standing, like these ones, or can be attached to a wall (which is a little easier to construct and requires fewer and cheaper materials). You only have a limited amount of space for your messaging, so you can’t communicate anything long or complicated, but if you can display them in a populated place for a long time, you will get the attention of a lot of people. Provides some education and awareness for a large number of people, without having to be there and interact with each of them in person. Can build visibility for your group. Gives group members the change to work together on something tangible, creative, and fun, and to later see the final product out in the world. Once the silhouettes are created, they can be re-used many times (i.e. 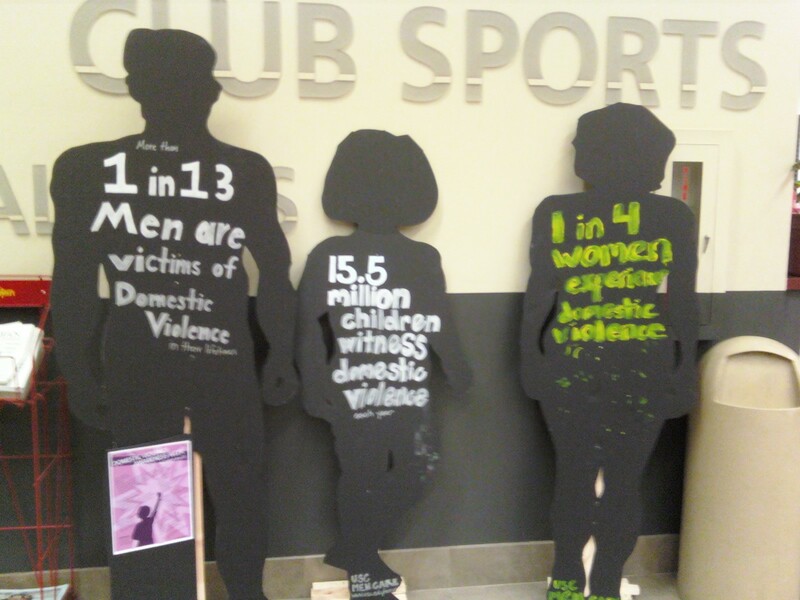 at different locations, or every October, during domestic violence awareness month). At least a few weeks prep time, possibly more to get necessary permissions. Research or statistics about gender-based violence (sexual assault, domestic violence, queer bashing, etc.). A display location, and permission to display there for a period of time. Some big pieces of foam-core, cardboard, paper, etc. A way to project pictures on to your material, or someone with artistic abilities. Paint or markers to write statistics on your silhouettes, or big print-outs of your statistics to attach to them. Stands, hangers, that sticky stuff for hanging posters – some way to have the silhouettes stand up, either on their own, hanging from something, or attached to a wall. Chose a display area, making sure to consider the places where the most people are the most likely to see the display, whether they will be willing and able to pay attention to it there, and whether it will be safe. It would be a shame to put all this effort into making the silhouettes only to have them vandalized, destroyed by rain, or accidentally thrown away! Get permission to display the project there, ideally for some length of time. This process will look different depending on your group’s location, resources, and connections, and where you want to display the silhouettes (for a group working within a religious institution, it may be as easy as asking the leader of the congregation; on the campus of a large university, it may require making multiple contacts to different deans, administrators, and staff). See if there is a policy about public displays, as that may make your work here easier – or let you know quickly that a particular location will not work. Gather statistics and facts to display on your silhouettes – if you’ve done some research already, it will come in handy here. When it comes to the statistic, try to get the most accurate and current figures, not the most shocking ones. The idea is not to scare people into action, but to make the usually-hidden issue real and emotionally compelling by giving humanizing it. Make your silhouettes. Find some silhouettes on the internet that you like, and draw them on the cardboard or other material. You can project the image onto the material and trace it, or have someone with artistic ability draw them on free-hand. Then carefully cut them out – cutting chunks of material away a little bit at a time is easier than trying to do the whole outline at once. Paint on or attach the facts or statistics you found – make sure they’re legible and easily understood. If you’d like to, you can also add your group’s name and some kind of contact info (a twitter hashtag or tinyurl would be effective but unobtrusive), so people can get in touch or join the group. Put them up in your display location. Don’t forget to take them down at the end, and put them away somewhere safe to be re-used later. Feel free to modify this idea to suit your group or community—and as usual, comment below to share any ideas you have, changes you made, or problems that come up. I’d love to see some pictures!